6 Easter Centerpiece Ideas From Europe: Fast, Fun & Easy To Make! Fast, Fun & Easy To Make! Paper Easter nests with dyed duck eggs. See the entire Easter table here! These little paper Easter nests are made from strands of shredded kraft paper, coiled and tied into loose knots. They're incredibly versatile. Their 'craftsy' simplicity goes with many styles, and really with any color under the sun. To create a good color contrast with the dull tan paper, dye white Easter eggs rather than brown ones - you'll get brighter, more vivid colors. The paper Easter nests look great just lined up, single file, across the center of the table. No two look the same (even if you tried). You can make the nests in any size, but if they're larger, place each nest on a plate so it doesn't fall apart. For more photos of this design, check out the Easter Eggs Centerpiece page. If you have a few tall, narrow glass vases (or tall drinking glasses), you can make this Easter table center piece in no time at all. With plain solid colors it's perfect for a cool, contemporary, minimalist look. See the entire Easter table here! If you're using real eggs, hold the vase almost horizontal to feed the eggs in, and then jiggle them gently down to avoid breakages. Easter candlestick centerpiece - Full how-to instructions here! These Easter candlesticks have got to be the most easy-to-make Easter table decorations ever. Simply place a suitable candlestick on an appropriately-sized plate, and surround it with Easter eggs. I used cheap candlesticks from Ikea, but think of the effects you could create with antique silver heirlooms or a set of beautiful turned-wood candleholders! See more of this Easter design on the page about Easter Table Decorating. 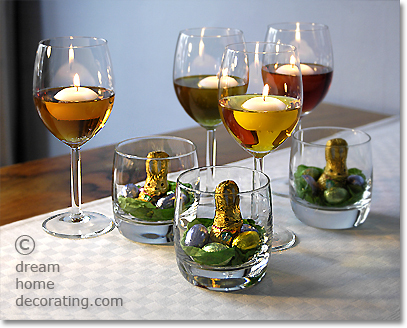 Easter lights & mini nests in glasses - instructions for creating the centerpiece here! Floating candles in dyed water and tiny Easter nests in glass tumblers - you can put this entire centerpiece together in 30 minutes or less. The prettier your glassware, the better this idea will look. Try reversing the arrangement: build the 'nests' in stemware glasses or smallish footed bowls, and float the lights in low water glasses. See the entire Easter table on the page about Easy Easter Table Decorating! Create a French look with Easter eggs in a bowl, surrounded by croissants and similar French-style breakfast rolls. Makes a lovely Easter table centerpiece to top the lazy Susan at breakfast! ... as well as plain glazed earthenware bowls in pale green or yellow ochre. See photos of the entire 'French' Easter table decoration on the Easter Table Center Piece page! Here are the little paper Easter nests once more, but this time in an Easter dinner table setting. You can create very diverse Easter table settings with these paper nests. Pictured here, they 'wander' casually (and randomly) across the dinner table. Light-brown kraft paper, deep indigo and white make wonderfully serene color combinations, and your colorful Easter eggs will create the perfect accents. Here's a photo shoot of the entire blue/white Easter dinner table. Enjoy! Return from Easter Centerpiece Ideas to Easter Craft Ideas.